Barely six days to the presidential election, a total of 72 presidential candidates and another 72 Vice-presidential candidates are expected to run for the presidential election. In all, and as released by the Independent National Electoral Commission, INEC, there are 144 names of the presidential candidates and their running mates. As seen in the INEC’s list, the Social Democratic Party did not present presidential candidate or running mate for the election, as two persons –- a former Minister of Information, Jerry Gana; and a former Cross River State governor, Mr. Donald Duke,are both laying claim to the party’s ticket. Of all the presidential candidates seen, 20 of the candidates posses just the West African School Certificate, WASC or West Africa Examination Council certificate otherwise known as Senior School Certificate Examination, as their highest academic qualification. Among prominent candidates who fall in this category is the candidate of the ruling All Progressives Congress, APC, Mohammadu Buhari, whose highest academic certificate as shown by the electoral umpire, is WASC. Media executive and 47 year-old publisher of SaharaReporters.com, Omoyele Sowore, who is the candidate of the Africa Action Congress, AAC, according the INEC’s ,also presented WAEC as his highest academic qualification. Others who equally presented WAEC as their academic qualifications, are Mr Shipping Moses Godia of the All Blending Party, ABP, whose age, INEC shows as 39 years; 54-year old Chief Umenwa Godwin of the All Grand Alliance Party, AGAP; Okere Evelyn of the ANR and 70-year old Gbor John Wilson of All Progressives Grand Alliance, APGA. Others are 38 years old Obinna Uchechekwu of Advanced Allied Party, APP, Abah Lewis Elaigwu, a 48 year old candidate of the Change Advocacy Party, CAP; 42-year old Mohammed Ali of the Democratic Peoples Party, DPP; Nadu Nnamdi Edozie,48 years old candidate of the Independent Democrats and the Justice Must Prevail Party, JMPP, Sunday Eguzolugo, whose age, according INEC’s record, is 46 years. The candidate of the Liberation Movement, Azael Vashim,35; candidate of the Peoples Party of Nigeria, PPN, 56 years old Major Hamza Al-mustapha,56;36 year old Ahmed Buhari of Sustainable National Party, SNP as well as 43 years old Isa Bashayi of Masses Movement of Nigeria, MMN, all also presented WASC or SSCE as their academic qualifications. Speaking to Vanguard on the implication of possession WAEC as a candidate for the country’s number one seat, a legal practitioner, Barrister Charles Edo, said there was nothing wrong with presentation of the certificate since the extant law of the country permitted it. “That is what the 1999 Constitution (as amended) stipulates for now and until there’s an amendment to that effect, anybody with WAEC or SSCE as the case may be is deemed qualified to vote and be voted for for the position of president of Nigeria. 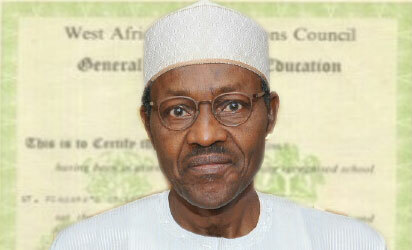 But he tasked the National Assembly to consider amending the Constitution making it mandatory for seekers of the office of President of the country to mandatorily posses a university degree or Higher National Diploma,HND from a reputation polytechnics as the least minimum academic qualifications. But also, speaking on the issue, Executive Director of Global Peace and Life Rescue Initiative, GOPRI, Amb. Melvin Ejeh, said the extant law was preferable, saying the legislature should not consider tempering with the law because according to him, doing so will restrict competency. “Paper qualifications should not be used as yardstick for who occupies the highest office in the country. We have many qualified hands that can be in that office and leave good lasting legacies for generations yet unborn. So on that basis, I suggest that we should keep on with our extant law as regards qualifications to the office of the president,” he said.